Proform ZT10 Treadmill Review- The ZT Series Sequel! This is yet another ZT Series I have reviewed in a row. First, it was the ZT8, then the ZT6 and now the ZT10! There is also the ZT3 which I think people may not be so much interested in because why would you go for the obsolete one when there are upgraded ones such as the ZT6, ZT8, and ZT10 treadmills. However, I wish to have all the series reviewed on this site so that this site will be a one-stop shop for all the Proform ZT models. The Proform ZT10 Treadmill review intends to reveal what this latest series has got and what makes it tick. As I have observed during my previous reviews on ZT6 and ZT8, the difference between these two was either the motor capacity was increased/upgraded over the preceding treadmill or the size of the console was made bigger or the deck track was also made little inches more. And of course, as the subsequent models are upgraded so does the price. So, it is a simple math, better features pricier the equipment becomes. Expect a slight modification with the Proform ZT10 as it’s the latest model. As a matter of fact, the motor is 3.0 CHP Mach-Z against 2.75 CHP that is for the Proform ZT8. It is also adorned with an oversized LCD Display and supports 350 pounds weight user. If you are the type that likes them big, then no doubt this is the treadmill you should be looking at. More interestingly even with the size, it will not take up space because it is foldable and can be stored anywhere you find it convenient. Oh, the weight, that is not a problem too because it has got these transportation wheels that would make movement easier. If you had read my Proform ZT8 Review, you will understand that they both have similar features only that some of the features were improved upon by increase on the size and capacity, and of course the price too. Let’s see the overview of the features and pros. These are the features but not every one of them, though. The track your training systems includes 32 preset workout apps, 7’’ backlit display, and routes that can be programmed via Google maps. It is called the high-end treadmill for a reason. ProShox Cushioning– As you may already know, this helps to reduce the impact on the joints for more comfortable workouts and recovery. EKG Heart Rate Monitor– This helps to display your heart rate on the backlit LCD display as long as you are holding the handlebars that have the sensors on them anytime you are exercising. However, it does not come with chest strap heart rate monitor but do have Bluetooth wireless chest strap that is compactable with it but is being sold separately. CoolAire Workout Fan– I guess you already know what that one does. This inbuilt fan keeps you cool at all time and is controlled by a Quick console that allows you to adjust the speed. 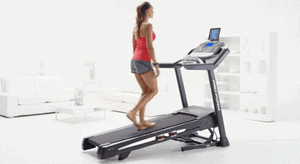 0-15% Incline – This feature can really help you to gain result 2 times over because of the incline. 15% incline is enough to make the workout challenging and work on the muscle groups. Its Quick Control allows you to control the incline from 0 to 12% without having to interrupt your strides just by the touch of a button. iPod Compatible Port – This allows you to rock your way through your workout to achieve your goals with your favorite music. Your MP3 or iPod can simply be plugged into Intermix Acoustics 2.0 Sound System and listen to your music through the 2’’ sized speakers. 7’’ Backlit Display- Displays and tracks your stats such as the speed, distance, calories burned, and time. With this, you can track and compare your performance with the previous to know if you are improving or not. 20’’ W by 60’’ L Deck- With this size of deck is good for all individuals of different height size because it will allow them to stretch their strides very well and as a result, they will be more comfortable to achieve their goals quickly and conveniently. 3.0 CHP Mach-Z Commercial Motor– This is a reliable motor that will help you to achieve your goals without the fear of breakdown. It has this incredible power for interval, speed or endurance training and also eliminates noise as all the components will be kept cool. 32 Workout Apps– It has 32 incredible workout apps that were designed by professional and certified personal trainer. Every workout automatically adjusts your incline and speed, is that not awesome? Warranty– There is a lifetime warranty on the frame and motor, 3-years warranty on parts and 1-year warranty on labor. The only downside to this machine is that you have to buy your own Bluetooth wireless chest strap heart rate monitor in order to have your heart rate read even when you are not holding the handlebars that have the sensors. I suppose, they should have included that to make the ZT10 outstanding. From the review, a lot of features were improved upon and also added when compared with ZT8, which makes the Proform ZT10 special. Aside from the excluded chest strap heart rate monitor, the unit was almost perfect, although nothing is ever perfect. Like I said earlier if you love something roomy and sophisticated you have to seriously look at this equipment. Even though it is a big unit it still does not take space or difficult to move because of the features it has that make all to be easy. Please do drop your comment in comment box below. Wow! Treadmills have really moved on since I first started using them 20 years ago, I think they have really dropped the ball by not supplying a telemetry strap with this great bit of kit though. Yes, Stan, they should have included the chest Strap heart rate monitor, however, it is still a good buy. I am a fan of the ProForm Brand and so it was good to come across this review. I always love the cushioning and the fan. What gets me all the time is the attempt they make to keep up with the latest technologies and so it is good to see the ipod compatible port and the 32 Workout Apps. Sounds like a good buy. Thanks for the information. Yes Josephine, they are really improving on the features so that it can be useful and at the same time comfortable for users. I’m pleased to come across this post. I am looking to build my body and improve my cardiovascular fitness. It was definitely worth the while stopping to read this valuable content. Thank you, Lawrence, for the visit and it is a good idea to get by to shape. Hello Evie, if I can recall, I think I mentioned that this unit is a space saver because of its ability to fold. So, yes, this can be folded and be stored in unlikely places; good for those that do not have space. 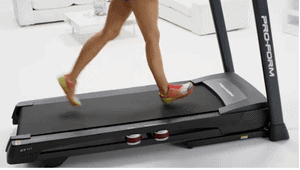 This seem like a great choice when it comes to treadmills. I had no idea they came with built in fans, that can come in really handy. I like the incline feature, it seems like it would help with a harder work out. Thank you, this will be very helpful when it comes to picking a treadmill looks like the ZT10 is a great choice. Oh, yes, you can say that again Vicky, this unit is great for people that really into running or professionals.